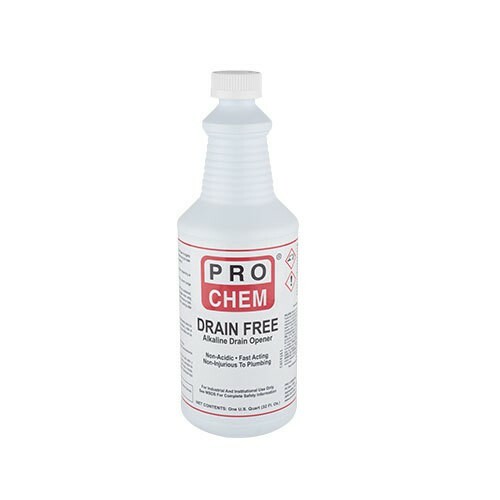 DRAIN FREE | Pro Chem, Inc. DRAIN FREE is a high alkaline drain opener containing a blend of mineral alkalis to aggressively attack all types of organic and cellulose blockages in drains and pipes. Unlike pure lye products, it contains potassium to form highly soluble reactions that will not form a new blockage further along in the drain system. Unlike acid-based openers, contents are safe and noninjurious to pipes, pipe glue and septic systems. Pour 16 ounces of DRAIN FREE directly into drain and allow to stand 1/2 hour. Repeat if necessary. Extremely heavy grease stoppages may require overnight contact. For large industrial drains use 32 ounces of DRAIN FREE. Let stand 1/2 hour flush and repeat if necessary. FOR PREVENTIVE MAINTENANCE: Use 16 ounces of DRAIN FREE weekly to prevent sludge buildup. Do not handle or use until safety precautions have been read and are understood. When adding solvent keep away from fumes that might be produced. Do not stand over opening when using DRAIN FREE. Do not add to hot water. Wear face shield or goggles, rubber gloves and protective clothing when handling. Do not allow solution to contact skin, clothing, mucous membranes or eyes. Do not swallow. Do not use with, before or after other drain openers or chemicals. While making solutions, add slowly to surface to avoid splattering.